Vicky Free spends a lot of time thinking about what women want and need. As director of women's initiatives for McDonald's USA, her job is to make the restaurants an irresistible destination for women. Two years ago, Free was promoted to her current post as part of an initiative to stretch the fast-food giant's customer base. It's been the latest success for this ambitious 2004 Kellogg School Executive MBA grad who demands excellence from herself. The introduction of a premium salad line in 2003 as part of the "Go Active" Happy Meal for adults represents the highest profile initiative of Free's tenure to date, with more than 300 million sold in the last two years. Customers received a pedometer with the purchase of any premium salad, "a simple way to encourage more exercise,"notes Free. This spring, Free led the national launch of the new Fruit and Walnut salad, which has turned McDonald's into the world's largest restaurant buyer of apples. In addition to the responsibility for launching products focused on women, Free also contributes valuable insights whenever the company is deciding how best to attract more women into its franchises. "My job is to be a partner in addressing issues like how we renovate restaurants, pricing for today's budget all focused on what will drive interest for women," says Free. "For example, women are into the details real cheese, grape tomatoes, Paul Newman salad dressing. We're looking at the market holistically, planning three to five years out. Where is the industry going, where are customers going?" After graduation from the University of South Carolina with a degree in journalism and mass communications, Free worked for Sunrise Enterprise, a firm in South Carolina specializing in marketing to African-American clients, and in county government in Columbia, S.C. When a few job-seeking friends ignored her tip about an available marketing position at McDonald's, she applied herself and got the job. 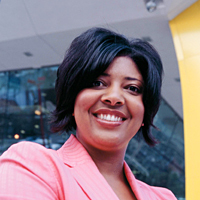 She quickly moved up the ladder to field director in Detroit, then to corporate headquarters in Chicago, where she led the development of McDonald's "365Black" campaign as director of African-American consumer marketing, before being promoted to her current position. In conversation, Free's business persona shines through: confident but not confrontational, serious about her work but also able to convey a sense of humor. "For women and people of color in particular, it's important to have moxie. I say, 'Stop asking for permission. Go until someone says stop,'' she states. "I see being a woman as a crown and a badge. It doesn't define who I am, but it is part of me. When I walk into a room, I don't think people can dismiss me. And part of that is because I won't let them dismiss me." Free's strong will to succeed extended to graduate school. She decided three years ago that Kellogg was the premier school for marketing, so it was the only one to which she applied. Hoping to expand her thinking and learn other business disciplines and perspectives, she says she acquired those insights and a lot more. "I learned how to use my left brain and right brain to get around a barrier, how to look at a problem in different ways, to see if it might be a symptom of a different issue. I learned so much not just expanding my knowledge base, but how to think," she says. While at Kellogg, Free spent a lot of time talking with other women students, comparing stories about their careers and lives. Although more women are working in corporate America, few occupy the corner offices. Free says marriage and raising a family have a greater impact on women's careers than on men's professional lives. "As a single woman, I often think about what will happen to my career if I get married and have a baby," Free says, adding that much of the opportunity to change gender-based inequities lies with women recognizing their responsibility to each other. "Maya Angelou has words to live by, 'When you learn, teach. When you get, give,''' she says. "If the women in corporate America would take that to heart, we could open more doors than anyone could ever close."